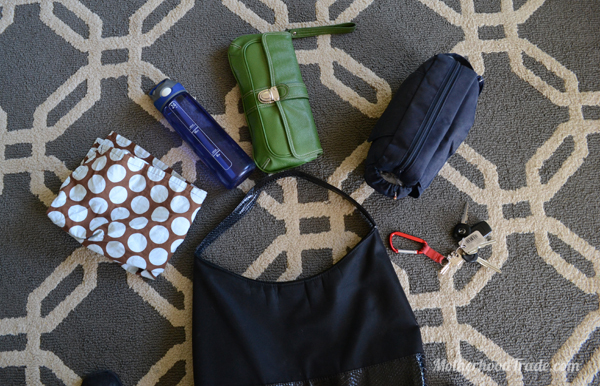 4 Main things: Nursing cover, Water bottle, clutch and diaper bag. My keys clip onto the the purse handle. Nursing cover: This is a MUST if my babes are still nursing, I’m ready to nurse whenever they are, no matter where I am! This is definitely one of the best gift baby shower gift I have ever received! Not only is it uber cute, but I have put it to SO much use with all three of my tots. My sister in law made it, she’s phenom. 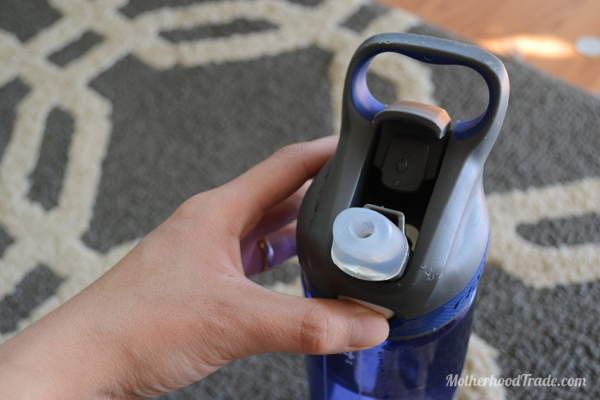 Water Bottle: This is the BEST waterbottle I have personally ever owned. It does NOT leak (I’ve used SO many leaky bottles.. UUuuuggggggh. The. Worst. In. The. Purse. ), easy to use because it pops up a straw on the push of a button, no spills if the kids need a sip. Keeps us all hydrated. It is a Contigo© bottle, It is pricier than I would normally spend on a water bottle but COMPLETELY worth it. Clutch- Why a clutch if you already have a purse?? 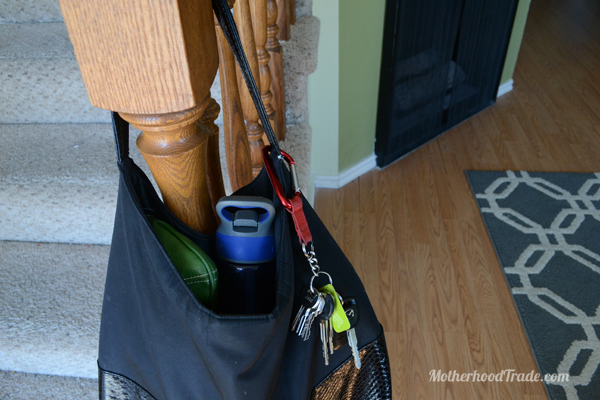 Think of it like a mini-ready-to-go-out-the-door without-kids-purse. 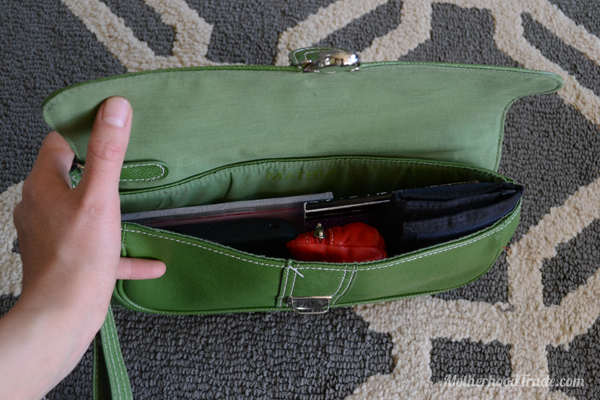 I can also easily put it in another purse or backpack if I want a change of look or function. It holds everything I need. 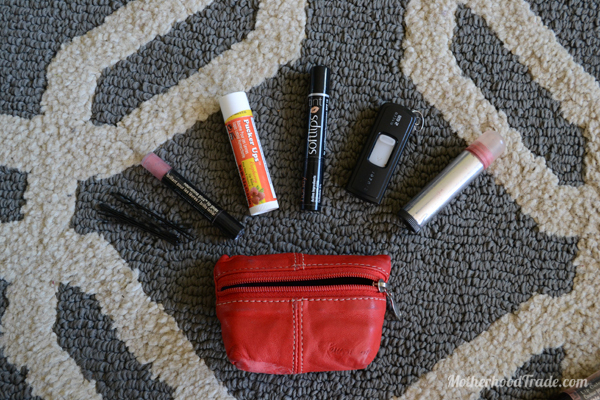 Here are my personal essentials: phone, wallet, a little lip shimmer, little coin pouch (see below what’s inside), pen and notebook for inspiration and checkbook. Sorry, I got this at the DI thrift store so don’t even know where to find this specific one, but here are some fun ones. 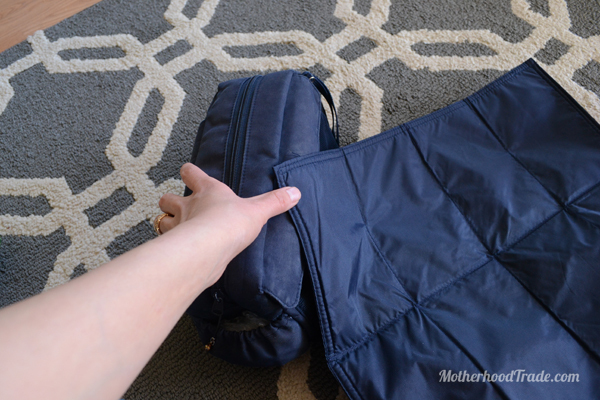 Diaper Bag: I LOVE this compact diaper bag SO much. 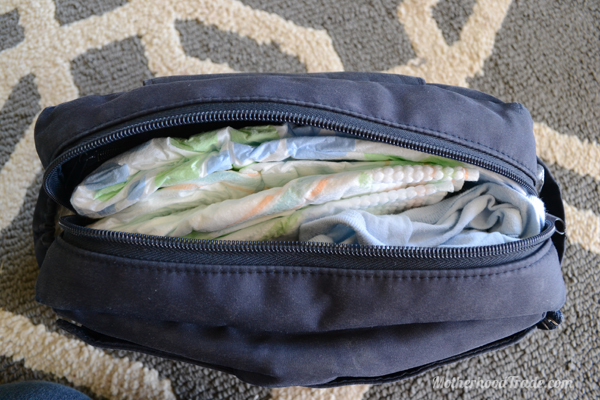 It is small, ALL diapering needs are self contained and NOT my WHOLE purse. I don’t carry a diaper bag, I carry a purse. 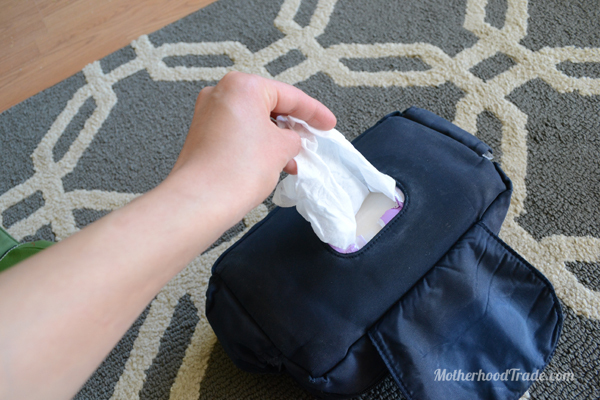 If I need to bring a diaper bag (anywhere with kids) I throw this in!! This is what I hand to the sitters. This is what I throw out of my bag if i’m not going anywhere with littles. Features I love about this little bag is that I can put lots of diapers, I will even put a onesie and bib in the main pocket. It comes with a changing pad It’s small but nice to have. It comes with one of those small plastic wipe containers to refill but they ran out or dried out SO fast and it was a hassle to refill (I have no patience). What I did was just slip a whole package of plastic packaged wipes (I took off the plastic dispenser thing) and now I have a seemingly endless supply and it stays moist! There is a zippered pocket inside just for the wipes compartment. YAY! This rad ‘quick change diaper bag’ can be found here for a good deal. 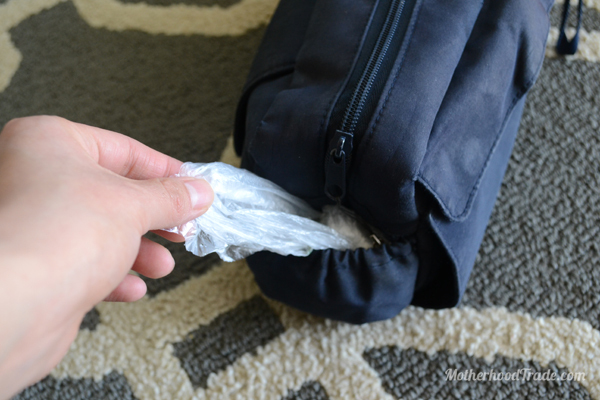 I also stuff plastic bags (the produce bags left from grocery shopping) in the pockets. I’ve found there is always need for those even beyond taking out soiled diapers!! I know you can buy them but I like reusing as much as I can. AAAAND…Just so I can prove to you that I’m REALLY NOT naturally an organized person, take a look at what I dump out of my purse after about a week (or less?) of not going through it…pretty, eh? 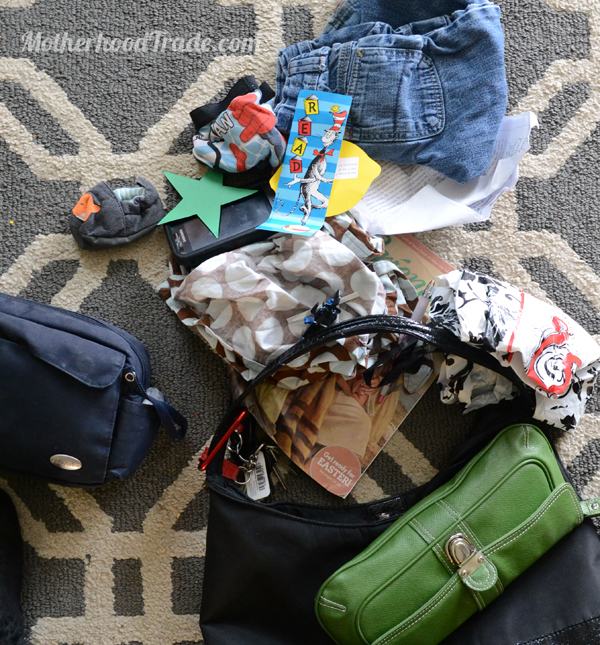 Thats what I LOVE about this trick of the motherhood trade…reorganizing is a cinch!! 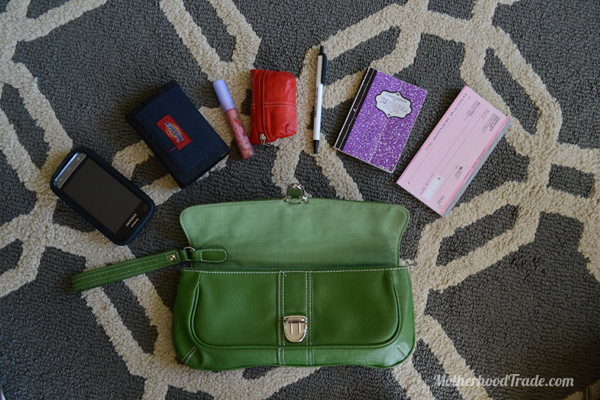 Just pull out my four items and put them in my purse and everything is back in order. Except my floor. But at least my purse is beauuuty again. I just want to end with a tribute this this black beauty. (cue sad violin music) It was a freebie at Sally Beauty Supply and it endured so much use from me and my boys. It used to hang on my banister ready for me to grab out the door. But then my three year old hung on it. And the handles broke. Sniff. 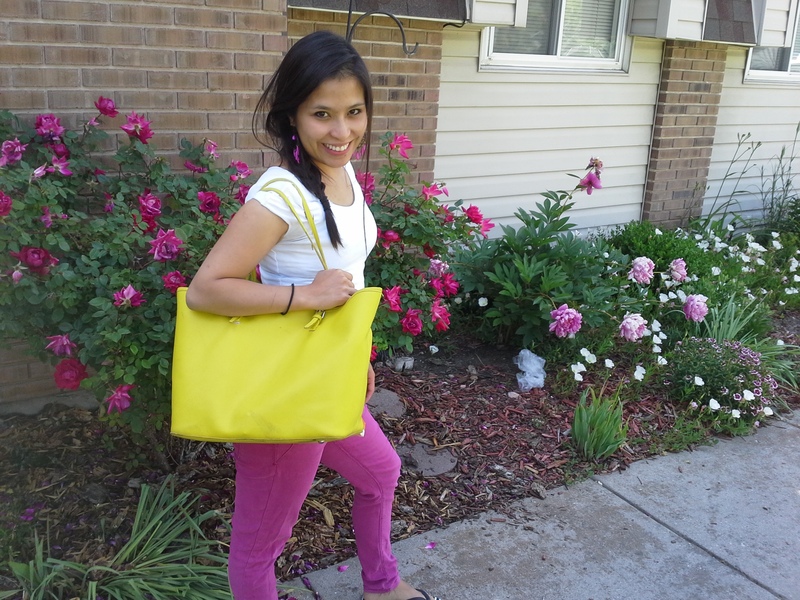 I was sad but then happy again realizing it was a good chance to get a NEW mama bag.I found the perfect one: a clearanced YELLOW purse, sqeeeeeeee! LOVE. I don’t think it’s gonna last with the skinny handles but I’ll love it as long it survives us. 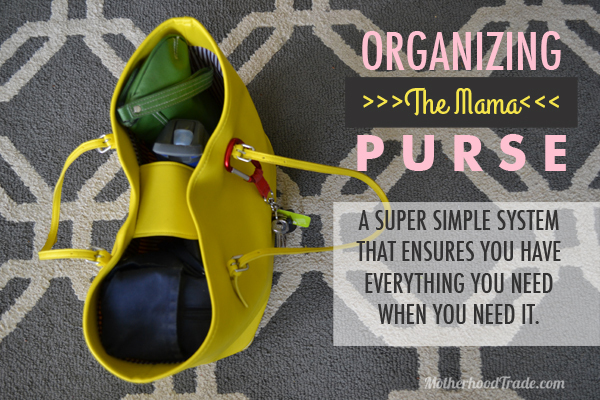 What are your ‘bag of tricks’ when it comes to the Mama purse and organizing the chaos?? We all wanna hear!